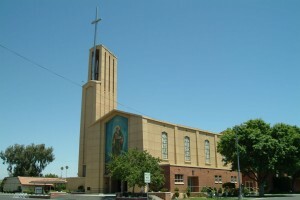 St. Joachim Church in Madera, CA, a parish staffed by the Oblates of St. Joseph since the 1930s. As part of our charism to serve the local bishop in the particular needs he faces in his diocese, we also staff and administer parishes in many different parts of the world. Especially for the Catholic Church in the United States there is great need to help serve the many Catholics who are suffering because of the lack of clergy. We see that Divine Providence has made us available to our bishops in the United States, and so we respond by serving the people the bishops entrust to us. Our work in parish life though is still lived according to our spirit and charism, imitating St. Joseph and modeling the example given to us by the Holy Family of Nazareth. This has several practical implications for our work. First, we bring our spirituality to our preaching, teaching, and administrative duties by sharing our love for the Blessed Mother and St. Joseph. We work to be humble servants like St. Joseph and avoid taking on prestigious projects or endeavors that bring attention to ourselves. We try to imitate the hardworking example of St. Joseph by applying ourselves fully and giving to the community 100%. Just as St. Joseph cared for Jesus in his youth, we make youth ministry in our parishes a top priority. And finally, we maintain a strong community life and family spirit, always living together with other Oblates and support one another in prayer and ministry. Our Lady of Mt. 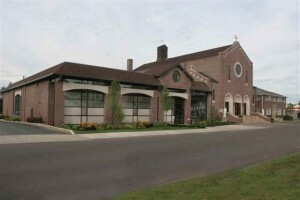 Carmel Church and St. Joseph Marello parish in Pittston, PA.
St. Joseph Marello’s life as a priest and his short time as bishop provides us with a pattern of pastoral service par excellence. As a priest he was available to the people he served, and was known as a trusted confessor and spiritual guide. As a bishop he was concerned about solid catechesis and being a spiritual father for the people of the bishop of Acqui, Italy. These are qualities that we as Oblates try to bring to our ministry in our parishes. We try to be available whenever possible, especially in the sacrament of confession and in the spiritual guidance that people need in their road to sanctity. We emphasize catechesis as that foundational instruction to know and love Christ for the rest of our life. But perhaps most importantly, we strive as brothers and priests to care spiritually for our people. We want to be like Marello in giving of ourselves to assist the people we serve in their need.